Freshman guard Buddy Boeheim was a 10-year-old fan when the Orange lost to Butler. (Trent Nelson | The Salt Lake Tribune) Syracuse coach Jim Boeheim at a practice session for the 2019 NCAA Tournament in Salt Lake City on Wednesday March 20, 2019. (Trent Nelson | The Salt Lake Tribune) Syracuse coach Jim Boeheim at a practice session for the 2019 NCAA Tournament in Salt Lake City on Wednesday March 20, 2019. (Trent Nelson | The Salt Lake Tribune) Syracuse coach Jim Boeheim at a practice session for the 2019 NCAA Tournament in Salt Lake City on Wednesday March 20, 2019. (Trent Nelson | The Salt Lake Tribune) Syracuse coach Jim Boeheim at a practice session for the 2019 NCAA Tournament in Salt Lake City on Wednesday March 20, 2019. (Trent Nelson | The Salt Lake Tribune) Syracuse coach Jim Boeheim at a practice session for the 2019 NCAA Tournament in Salt Lake City on Wednesday March 20, 2019. (Trent Nelson | The Salt Lake Tribune) Syracuse coach Jim Boeheim at a practice session for the 2019 NCAA Tournament in Salt Lake City on Wednesday March 20, 2019. (Trent Nelson | The Salt Lake Tribune) Syracuse Orange guard Jalen Carey (5) as Syracuse practices for the 2019 NCAA Tournament in Salt Lake City on Wednesday March 20, 2019. (Trent Nelson | The Salt Lake Tribune) Syracuse Orange forward Bourama Sidibe (34) as Syracuse practices for the 2019 NCAA Tournament in Salt Lake City on Wednesday March 20, 2019. (Trent Nelson | The Salt Lake Tribune) Syracuse Orange guard Howard Washington (10) as Syracuse practices for the 2019 NCAA Tournament in Salt Lake City on Wednesday March 20, 2019. 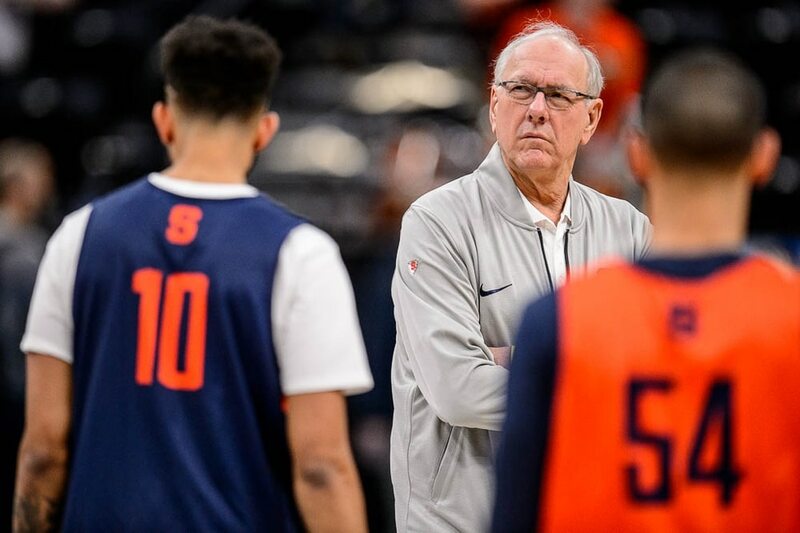 (Trent Nelson | The Salt Lake Tribune) Syracuse Orange guard Buddy Boeheim (35) as Syracuse practices for the 2019 NCAA Tournament in Salt Lake City on Wednesday March 20, 2019. (Trent Nelson | The Salt Lake Tribune) Syracuse Orange center Paschal Chukwu (13) as Syracuse practices for the 2019 NCAA Tournament in Salt Lake City on Wednesday March 20, 2019. (Trent Nelson | The Salt Lake Tribune) Syracuse Orange forward Bourama Sidibe (34) as Syracuse practices for the 2019 NCAA Tournament in Salt Lake City on Wednesday March 20, 2019. (Trent Nelson | The Salt Lake Tribune) Syracuse Orange forward Elijah Hughes (33) as Syracuse practices for the 2019 NCAA Tournament in Salt Lake City on Wednesday March 20, 2019. (Trent Nelson | The Salt Lake Tribune) The ball is dunked as Syracuse practices for the 2019 NCAA Tournament in Salt Lake City on Wednesday March 20, 2019. Syracuse coach Jim Boeheim has said all he will say about what happened four weeks ago, having insisted that people show concern for the victim of the fatal accident, rather than worry about how he’s dealing with everything. So he’s his usual self in news conferences, taking strictly about basketball and alternating between gruff and charming. Boeheim eagerly fields the questions he likes, joking about how Buddy Boeheim’s mother keeps saying the freshman guard merits more playing time. And yes, he knows who will start in place of suspended guard Frank Howard in Thursday night’s NCAA Tournament game vs. Baylor, but no, he’s not saying who it is. Boeheim, 74, is making a 34th appearance in the NCAA Tournament in his 43 years as Syracuse's coach. 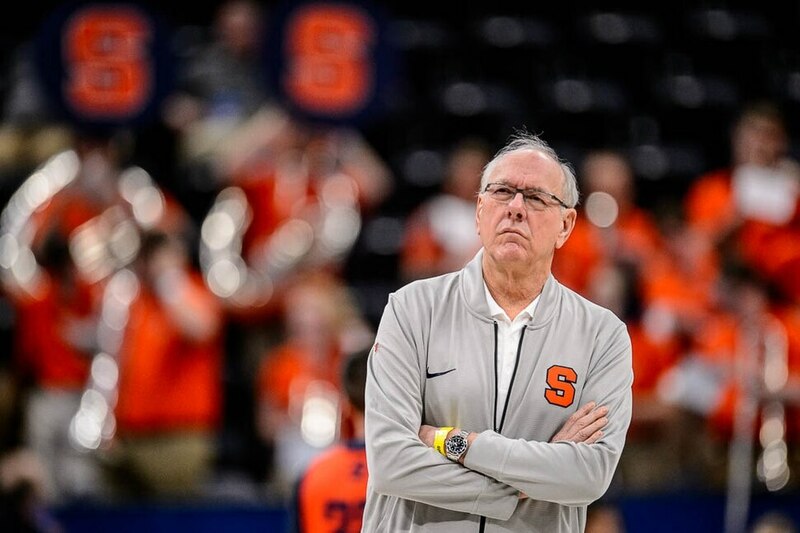 His son is a regular in the Orange's playing rotation and all signs suggest Boeheim will keep coaching throughout Buddy's college career. So there’s Valter’s, and there’s basketball, and there’s real life, all converging in the past month. As Boeheim drove home after a Syracuse game, his vehicle struck and killed a man who had been involved in a freeway accident. In the investigation, Boeheim was cleared of wrongdoing. But he forever will be shaken by what happened. And now he’s a Syracuse rotation player, experiencing a season unlike any other and helping his father cope with what happened on Interstate 690. The son’s role is “taking his mind off some stuff and really just having some good family time,” he said. And the longer Syracuse's season lasts, the better, for multiple reasons. At one time, Jim Boeheim planned to retire after the 2017-18 season, with longtime assistant coach Mike Hopkins succeeding him. Before the transition could occur, Hopkins became Washington's coach. Hopkins is now a two-time Pac-12 Coach of the Year, leading the Huskies into an NCAA Tournament game Friday vs. Utah State in Columbus, Ohio. And Boeheim remains on the job at Syracuse, coaching his team again in Salt Lake City. He’s just like he’s always been, but never the same again.